Apply the adhesive (Urobond V or Hollister spray) on the whole contact area. Put it on (shave before use!) and hold approx. 30 seconds. Be sure that the back is secured or taped very well. Use some tape (if you want) or fix it with your underwear (two G-strings work fine). Connect the p-valve with the She-P connection and open the valve on the outside of your drysuit before use. Pee before the dive (in the water or on land) to be sure it is well placed and your P-valve is working fine. To be absolutely safe for the first dives: place a small diaper or super-absorbent sanitary towel. Use some tape or plug (if you don’t use a quick disconnector) to close it. Now you will not spill and wet your underwear while you change clothes. The outside part of the She-P contactarea is fragile and can tear, be careful when you remove it. Remove the adhesive from your skin and She-P: Use the removal pads. Baby oil for your skin is very nice. Be sure you remove the oil before applying your She-P for next dive. Be sure everything is desinfected before the next use. Rinse very well to avoid irritation. 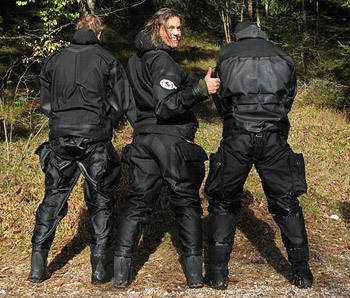 The P-valve in your drysuit must also be flushed with lots of clean water or vinegar. Please have a look at the Frequently Asked Questions!